Fort Collins is a college town in Northern Colorado that gets mentioned on many Best Cities in the US lists. It's also the town where I currently live. 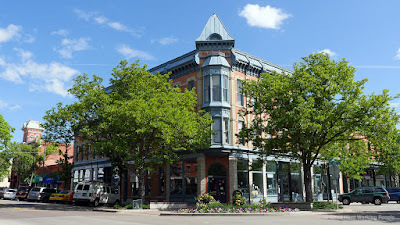 Fort Collins in Larimer County is perfectly situated along the Cache la Poudre River, between the Foothills of the Rocky Mountains and the Pawnee Grassland of the Great Plains. It's only 65 miles north of Colorado state capital Denver and about 35 miles south of Wyoming. The town started as a military outpost of the US Army in 1864. Since then it has grown to 56 square miles and a population of about 150,000. Fort Collins sits 5,003 feet (1,525 meters) above sea level - but has enough river banks, lakes and the magnificent Horsetooth Reservoir for you not to miss the actual sea (too much). Fort Collins is home to Colorado State University (CSU) and about 20 breweries; most notably New Belgium, Odell and (I suppose) Anheuser-Busch Brewing. Since moving to Colorado in 2013, I have shot a lot of 1-minute videos about individual places and events in and around Fort Collins. You can see a list of them HERE. It's been long overdue for me to make a single video giving an overview of this charming town. This week seemed like the right choice because it's the first video I got to shoot with my new Panasonic GH4 camera. Most of the footage was shot on 4k (Yay!) but down-converted to 1080 for upload. I'm still learning the camera, which explains the somewhat awful shot of the deer - since I accidentally shot that in 1080 and then played around with the digital zoom. But I couldn't not put it in. He's looking right into the camera! Not enough lists? Check out the truly ridiculously long list of Honors and Awards won by Fort Collins on the city's website. Personally, I have a few gripes with Fort Collins - but there's no need to publish that list right here. I'll be happy to share the negative aspects of this place with you over a delicious New Belgium Blue Paddle or Slow Ride next time we meet. The song in the video is “Redwood Trail” by Jason Shaw of Audionautix. He has made this and many great tunes available via a CC BY 3.0 license. Thank you again and again, Jason! In the next few days, I'll upload more photos to my personal blog and the In A Colorado Minute 2016 Flickr album.